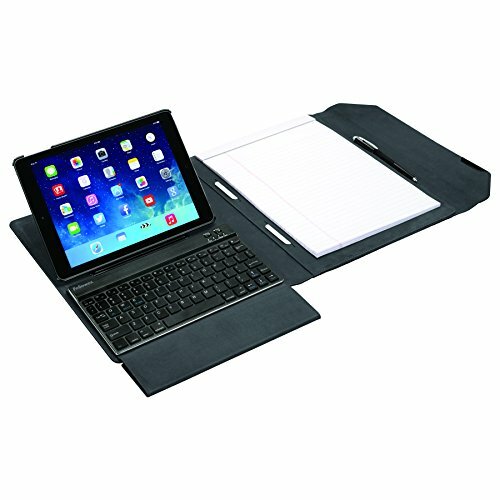 Slim, all-in-one mobile workstation allows you to conveniently carry and work with your iPad. Use iPad Air/Air 2 in-folio, free-standing or hand-held, in vertical or horizontal orientation, and at three viewing angles. Magnetically attach Bluetooth keyboard for enhanced tablet functionality. Includes removable Bluetooth keyboard (iOS Android and Windows compatible) with integrated wrist support for increased comfort and productivity. Also features a protective ballistic nylon exterior to keep your tablet safe. Folio features business card holders, pen loop, file folder, refillable letter-size writing pad pocket and magnetic closure. One-Year Limited Warranty.